The Mitchell County Historical Society presents programs for the general public on topics of historical interest. In an effort to increase the availability of these programs, we are posting video recordings of the programs. You can access our YouTube Channel or watch the videos below by clicking or tapping on the image. 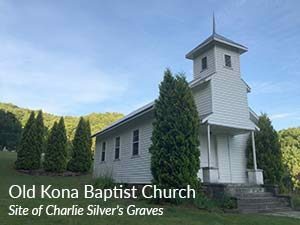 Here are videos associated with the special presentation on Frankie and Charlie Silver, held Monday, June 19 at the Old Kona Baptist Church in Kona, NC. In addition to John Silver’s presentation, you will find related videos that tell the Frankie and Charlie story in different ways. Click or tap on a video to view it on this page. You can also use the controls to expand the video to fill your screen. John Silver discusses his famous ancestors in a presentation at the Old Kona Baptist Church, a part of the 2017 series by the Mitchell County Historical Society. A music video by Yancey County native Ali Randolph recorded at the Old Kona Baptist Church with a modern-day spin on the Frankie and Charlie Silver story. Storyteller Bobby McMillon shares his version of the Frankie and Charlie Silver story. If you’d like to learn more about Spain’s early colonies in interior America, Mitchell County student Amanda Biddix produced this short video with information on the Spanish and Fort San Juan as part of National History Day in 2013.